Ever wonder how florists get those big, beautiful flowers? A little trick called disbudding might be the answer. Many plants will make unusually large flowers if they’re forced to make fewer of them. The technique is called disbudding because it’s most commonly applied to peonies, chrysanthemums, and roses, all of which have clusters of serially developing buds on each stem. But disbudding is really just a form of pruning, and it can be used on almost any flowering annual or perennial. The lead bud is usually the largest, even if you do nothing. Removing the flowers that would have come after it enhances the effect by permitting the plant to put more energy into fewer blooms. Disbudding is especially popular among exhibition growers, who are usually after that one perfect cut flower, rather than well-balanced plants or full-looking borders. As they have discovered, even spire-formers like delphiniums will make bigger leading spires if all the secondary blooms are removed from the stem. If you want the blooms to be really gigantic, limit the number of stems in each clump and be sure you have those stakes ready. Limiting the number of stems as well as the number of flowers will also work with summer phlox (Phlox paniculata) and Astilbe, but it won’t help with globe thistle, Joe Pye weed, or hardy asters. When in doubt, experiment. Assuming you don’t go hog wild with stem removal, this kind of extreme disbudding will have no lasting ill-effects on the plant. All herbs can be dried, but not all of them are worth the trouble. Parsley, chervil, chives, and coriander, to name four popular favorites that are widely marketed in dried form, taste more or less like hay that way, no matter how carefully they have been processed. Most of the others, including basil, dill, thyme, rosemary, sage, and tarragon, come through very nicely — changed, to be sure, but still useful. I’m a bit of a romantic so I like to dry my herbs the old-fashioned way: hanging them in bunches in my dry basement. The scent is heavenly when several different bundles of herbs are drying together. If the herbs have long stems with sparse foliage at the bottom, you can hang them in bunches. Use rubber bands or twine to tie loose bundles of eight stems or so. Hang them in the chosen spot (dark, dry, warm area that gets plenty of air circulation), and keep checking on them. If the herbs have tightly packed leaves (or flowers) that might rot before they could dry, strip them from the stems and spread them on screens. Prop the screens on piles of books or bricks so air can circulate. Over the past several years, many methods of drying herbs have arisen (including spreading them on a towel in the back seat of your car when it sits out on a hot day). I found a website that details six methods of drying — depending on the amount of time and money that you want to spend. Visit Mother Earth News for some ideas. No matter which way you dry them, the herbs are ready to store when they are brittle and should be removed from the drying area as soon as this happens. Strip the leaves from the stems, but leave them whole. Store in air-tight glass jars in a cool, dark, dry place for up to a year. Color is a clue: a pale look probably means a pale taste. Drying herbs is pretty commonplace and, for me, there’s nothing better than the fragrance of herbs drying in my basement. However, herbs that have been frozen taste fresher than dried herbs, but only for the first 4 months or so after freezing. After that, flavor declines rapidly, so freezing should be an addition to drying. To freeze lemon verbena, lovage, marjoram, mint, oregano, parsley, sage, and tarragon, use whole leaves (discard stems). To freeze dill, fennel, and thyme, use tender sprigs. Basil discolors when it is frozen, so if you want it to stay bright green, dip branches in boiling water, just for a second or two, then remove, discard stems, and gently dry the leaves. Whatever you’re freezing should be completely dry. Spread it out in a single layer on a cookie sheet and place it in the freezer. As soon as the herbs are frozen, usually in no more than an hour or two, pack them in heavy plastic freezer bags and put the bags in freezer-safe glass jars (canning jars) for storage. Chives don’t freeze well; they don’t dry well, either. Use them fresh or substitute green onion tops. Another popular method for freezing herbs involves chopping them and adding them to liquid (water or olive oil), freezing them in ice cube trays, and pulling out just what you need to add to soups, sauces, gravies, etc. There are many places on the web with instructions on how to freeze herbs in liquids. Remember: freezing herbs won’t help you any if you forget to use them, something all too easy to do. As a reminder, post an inventory of frozen herbs where you will see it when you reach for the seasonings. Oh, those delicious spears are one of the great harbingers of Spring in Wisconsin, and it’s a bit heartbreaking when it’s time to draw the harvest to a close! 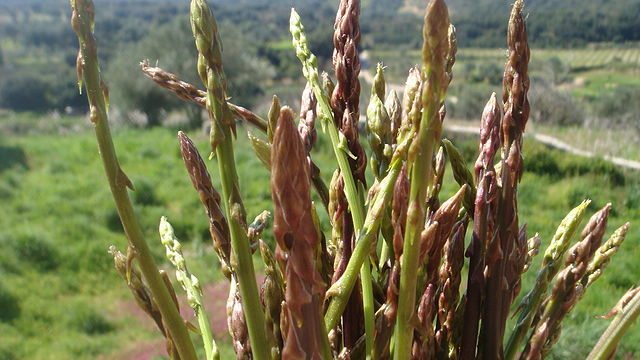 From Diana Alfuth, horticulture educator for Pierce & St. Croix County UW-Extension in Wisconsin, comes the following advice for caring for your asparagus patch. “You should stop harvesting when the emerging spears are about the diameter of a pencil; this will give the crowns time to rejuvenate for next year’s harvest. When harvesting is over, fertilize according to soil test results, or with a complete fertilizer such as a 10-10-10, to replenish nutrients used during the harvest season. Let the ferns grow to collect sunlight and restore the root system. In fall, once the ferns have yellowed, cut them back and dispose of them to prevent overwintering of asparagus beetles and rust, two of our most common asparagus pests. Diana Alfuth, horticulture educator for Pierce & St. Croix County UW-Extension, teaches the master gardener program and is a frequent speaker throughout the region about gardening and sustainable landscaping. She is a regular guest on WEAU-TV and teaches landscape design at UW-River Falls.